Swaying palm trees, breathtaking coastal scenery, a crystal-clear lagoon and the southern-most coral reef in the world, all bless this World Heritage Site. The island’s isolation in the Pacific Ocean makes it home to 64 species of unique rainforest plants, teeming seabird colonies and one of the rarest birds in the world. Yet it remains only a couple of hours flight from either Sydney or Brisbane. Travel on this island is done primarily by foot on an excellent network of walking trails that criss-cross the island’s volcanic landscape. The spectacular Lidgbird and Gower Mountains project above the surface of the ocean and lead to stunning views from every vantage point. To maintain such an unspoilt paradise, the number of tourists to the island are restricted. Care and consideration from all visitors is vital to the preservation of this unique environment. We stay and dine at the amazing Arajilla Retreat ensuring that you’ll be wowed on and off the track. Arrive on Lord Howe Island mid-afternoon via a direct flight from Sydney, or in some cases from Brisbane. After settling in, we set off on our orientation walk. Please note, the following itinerary is just a rough guide, days may change depending on tides and weather. A morning walk to Transit Hill’s lookout tower provides panoramic views of the lagoon and ocean. At Blinky Beach, learn about the Kentia palm – a distinctive feature of the island, occurring naturally here and nowhere else in the world. In the afternoon, a reef walk at picturesque Ned’s Beach is a showcase of diverse marine life and vibrantly coloured corals. Meals: All meals will be prepared by the in-house chefs at Arajilla Retreat, including a cooked breakfast and an amazing two course dinner in the retreat restaurant. Lunch is a very substantial walkers lunch. Exploring the Lord Howe Island walks at the southern end of the island we will tackle a full day circuit walk. Among the many superb bird watching vantage points, Mutton Bird Point is most impressive. This seabird haven is home to a large colony of masked boobies which can be seen plunging into the ocean to feed on fish and squid. Onwards, through stands of unusual prop-rooted Pandanus trees, Boat Harbour’s secluded coral beach makes for a delightful spot for lunch. The first major climb of the trip ascends 400 metres up the flanks of Mt Lidgbird to Goat House Cave (an easier alternative is available). The last section requires some careful footwork, but fortunately there are fixed ropes to hold on to. Goat House Cave offers remarkable views, a close up look at the aerial acrobatics of the nesting red-tailed tropic birds, and is an excellent test-run for Mt Gower. Another full day on the Lord Howe Island walks, this time in the northern hills of the island – a favourite route among visitors and residents alike. Mt Eliza provides expansive views overlooking the Admiralty Island group, while Malabar Ridge’s vantage points make it easy to linger a while longer. North Beach is the quintessential tropical paradise with palm trees, pristine sandy beach and excellent snorkelling just metres from shore. The delightfully secluded Herring Pools are a microcosm of life, where the relentless ocean has scoured out circular ponds into the rock platforms. Taking a coral viewing boat back, there will be an opportunity to snorkel en route. Today, we walk Malabar Hill across the ridge to take in various lookouts. This is a spectacular walk with incredible views back across the island and out to sea as you walk. In the afternoon it’s free time. Various activities are available including snorkelling, deep sea fishing, golfing, biking, tennis, swimming and relaxing on the beach. A visit to the local museum provides a treasure chest of natural history and is a great place to learn more about this unique place. For those up for the challenge, join a local guide to scale Mt Gower – the highest mountain on Lord Howe Island at 875 metres above sea level. Much of the terrain is rugged and the climb is demanding, but for many this is the highlight of their visit. A trip to Little Island offers a less-strenuous alternative, and is home to one of the rarest birds in the world – the wood hen. Before leaving this paradise behind, a final walk takes visitors to the Valley of the Shadows and the Clear Place. Leaving the island, return flights bound for Sydney or Brisbane depart before lunch. Most of the tracks are well graded and easy to negotiate. The Mt Gower track is challenging and you’ll need to be reasonably fit, but it’s worth the effort if you’re up for it. Other excellent easier options will be available. For 6 nights, enjoy all the comforts of a 5 star luxurious Arajilla Retreat while taking in the island life. This accommodation is very special and a wonderful platform for us each day to set out from to explore the island. Healthy and delicious gourmet meals will be prepared by the in-house chefs at Arajilla, this includes breakfast, lunch and dinner – ensuring walkers are better than well fed. On one of the days we walk to one of the many secluded beach locations to eat a delicious bbq lunch by the seaside. Alcohol and drinks with meals are not included (except tea/coffee and juice with breakfast). 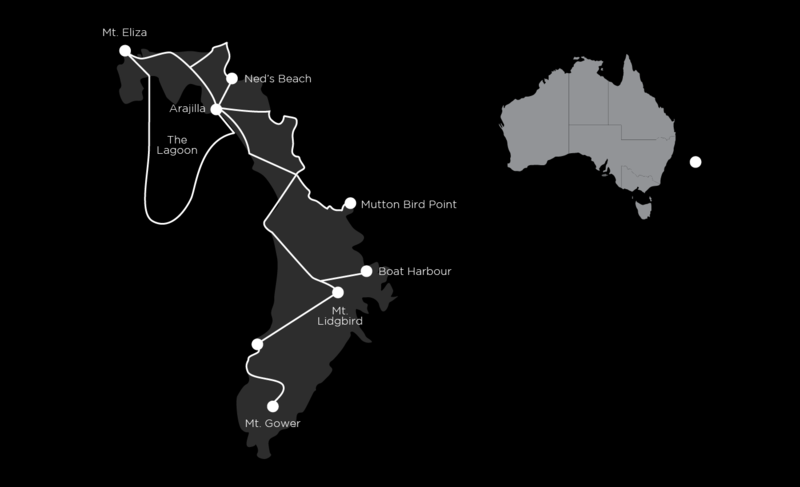 Flights to the island are only provided by Qantas Link. The earlier you book the better. Most walks are easy to moderate, although track surfaces can be rough and uneven. The two most challenging walks are Goat House Cave and Mt Gower which will suit those who like to challenge themselves a little. Although almost everyone always gets up Mt Lidgbird to Goats. An alternative walk is offered on both those days. As well as hiking we spend time on a boat trip snorkelling on reefs, lazing and BBQ-ing on the beach and sipping champagne at sunset. The walk starts at the Lord Howe airport where you will picked up and driven to your accommodation.